This course provides the information you need to start and operate your own mobile food business. Learn how to sell food to hungry people at strategic locations and make a good profit at the same time. You can sell food at busy down-town street corners, festivals and fairs, school events, church gatherings, ball games and craft shows. Successful businesses have been built around Pizza, Hot Dogs, Hamburgers, Barbecue, Coffee, Soft Drinks, Ice Cream, Pop Corn and many others. The 2 DVDs (2 hours and 45 minutes run time) present an overview of many aspects of a mobile food vending business. 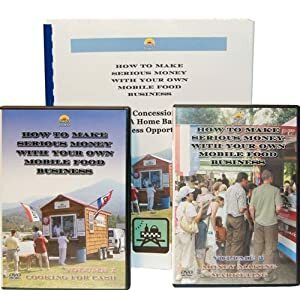 The author gives a complete tour of a fully equipped Barbecue Concession Trailer and shows how to cook, prepare and sell the various menu items that are essential to success. Further topics are: finding a Restaurant Commissary, selecting a great location and making extra money on weekends. You will also learn many inside secrets that are based on the experience of a thriving and successful food vending business. The included book (107 pages) is packed with additional business and marketing information. Helpful advice is given on selecting the best foods to sell, working with your local Health Department, purchasing food in bulk and increasing profits with catering jobs. Learn what cooking equipment you need and find out how you can get started with a very modest investment. Other tips and tricks of the trade include ways to design and build your own Concession Trailer. Also included are the favourite BBQ recipes that will help you win loyal customers who will come back for more day after day. This authoritative guide is the most comprehensive volume about the mobile food business on the market. It shows you in an entertaining and practical way how you can supplement your current income or even create your own full time job. Find out how you can take advantage of this opportunity and cash in on the basic human need of food! Since I am a BBQ’er, I appreciated this video and book. It is packed with useful information and takes a hands-on approach that is great. The videos are excellent, it’s as if a friend was showing you how to do the business and be successful. © 2019 Flaming Food | Log in | 128 queries. 0.279 seconds.